I recently had the pleasure to spend one week snorkeling and scuba diving in the Caribbean. True to my calling, I had decided to bring a film camera, and purchased a Nikonos V on eBay a few weeks before the departure. The Nikonos V, launched in 1984 and sold until 2001, is an underwater viewfinder camera with interchangeable lenses. It can operate at depths of 50m (150ft), beyond what is considered the limit for recreational scuba diving. Some lenses were specifically designed for underwater use, but the “standard” lens (a 35mm W-Nikkor) could also be used above the water, for white water sports or for photography in all sorts of very humid environments. A special “camouflage” version was even manufactured by Nikon for war correspondents following conflicts in some remote jungle. 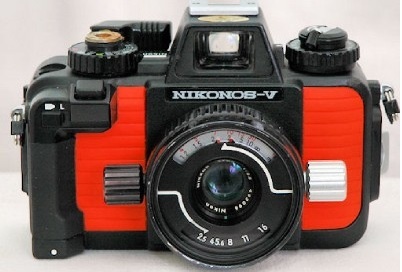 Technically, the Nikonos V – which is a viewfinder camera – is more or less aligned on the Nikon SLR bodies of the mid eighties: Through The Lens (TTL) exposure, aperture priority automatic shutter, and – importantly for an underwater camera – Through the Lens flash metering. I uses the same W and U/W Nikkor lenses as the previous Nikonos bodies, and provides no focusing assistance to the photographer, who has to guess the distance between the camera and the subject, and set the lens accordingly. I could not test the Nikonos V in its element. The one I bought on eBay happened to have a defective metering system, and the seller did not know enough about the camera to understand it did not work as it should have. I returned it and go my money back, but I was back to square one, with no camera for my vacation. Lesson #1: if you really want to buy a Nikonos V, buy it from a store specialized in underwater equipment. You will pay more (a good Nikonos V costs between $250.00 and $350.00) but the seller will be able to certify that the camera really works, and has not suffered from an unplanned bath of salt water in the past. When I bought the Nikonos V, I decided I needed a backup camera. 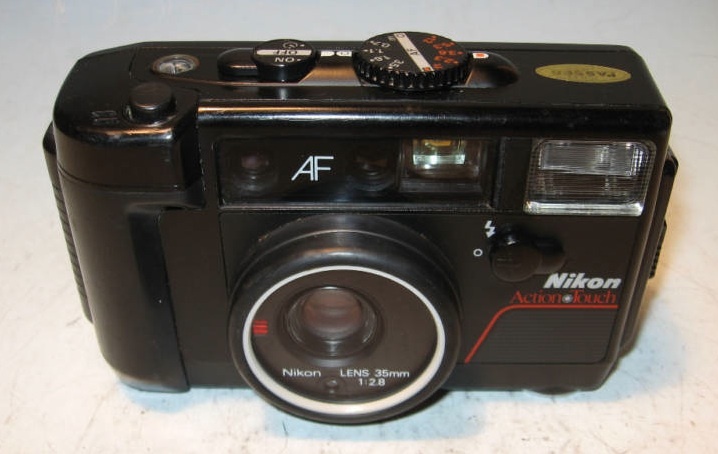 I found (on eBay again) an old Nikon Action Touch, an autofocus Point and Shoot from the eighties, designed for use in depths of 10 ft (3 meter) or less. I had read good reviews of the camera, and since I could have it for less than $8.00, the risk was minimal. I tried it in a swimming pool. It seemed to work. On the first dive in the ocean, it died. Salty water had found its way in the film chamber, making the camera unusable. Lesson #2: old waterproof cameras do not necessarily stay waterproof over time, and a dip in a swimming pool can not be compared to a dive in the ocean. Lesson #3 is to take the claims of the manufacturers regarding the water resistance of their products with a grain of salt (no pun intended). Cameras manufacturers now use the IP code (International Protection Rating) to define the water resistance of their products in different circumstances (sprays, water jets, immersion, for instance), but the performance of older cameras was more loosely defined, and important safety margins have to be taken. With two old film cameras out of commission, I had to admit that underwater cameras do not age well, and that buying a new digital Point and Shoot camera was the safest solution if I wanted to bring back at least one picture from my trip. The Canon Powershot D10 was the winner of a dpreview test last summer. It is rated “IP8X” equivalent at 10m (33 ft), making it appropriate for beach activities and for snorkeling. The Canon D10 is a typical middle of the range digicam – with a 12 Mega Pixel sensor, a 35-105 equivalent zoom, and 18 different “special shooting modes”, including “underwater” and “beach”. 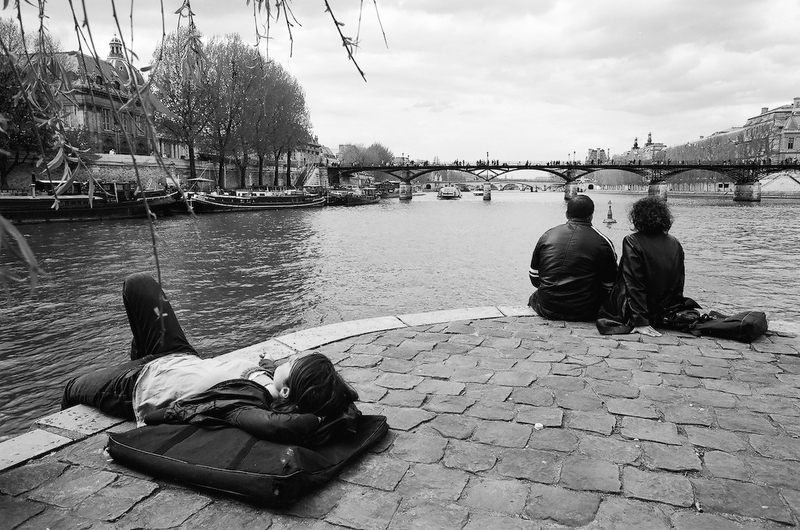 Selecting a special shooting mode is the only thing the photographer can do: the camera will take care of the rest. It does a good job at it – most of the time – but the inability for the photographer to really control the exposure parameters can be frustrating in complex lighting situations (sunsets, for instance). Rated for depths up to 10 meters, the Canon D10 can not be used for scuba diving, but can be brought along when snorkeling. Its “underwater” special shooting mode is very good at finding the right color balance, but the shutter lag is typical of a point and shoot camera (far to high), the autofocus reacts too slowly – or not at all, and pictures of mobile subjects are very difficult to take. The LCD monitor has to be “on” all the time, which drains the battery rapidly. That being said, a good diver should be able to bring back decent pictures of relatively static subjects located in shallow waters. Lesson #4: even dpreview comparative test winners can not overcome the limitations of their middle of the range point and shoot origins. Waterproof digicams are small and light, and will be faithful companions of white water or snorkeling adventures. But they offer little control over the pictures and are limited to a few feet of depth, which explains why dedicated diver-photographers use high-end digicams or SLRs, that they protect with massive (and often massively expensive) underwater housings. While on vacation, I had the pleasure to meet Dr Alain Feulvarc’h – he’s an MD, a passionate diver and amateur photographer who was volunteering as the scuba-doctor of our little group. He was not on the boat to teach underwater photography, but he shared a few tidbits of information: like most of the diver-photographers, he’s using a digital SLR enclosed in a metal underwater housing, and equipped with a very wide angle (10mm) lens. He also uses a 100 mm macro for close ups. Most pictures are taken with a flash (one strobe at least), and at close distance from the subject. He does not rely on the automation capabilities of the camera, and operates in manual mode. Underwater photography is a fairly complex activity, and using digital technologies improves the learning curve dramatically. I was surprised to see that even underwater, some photographers took the time to check the histograms of their images, and to adjust their settings accordingly; this trial and error process would be impossible with film. You can watch Dr Alain’s stunning pictures on Flickr. 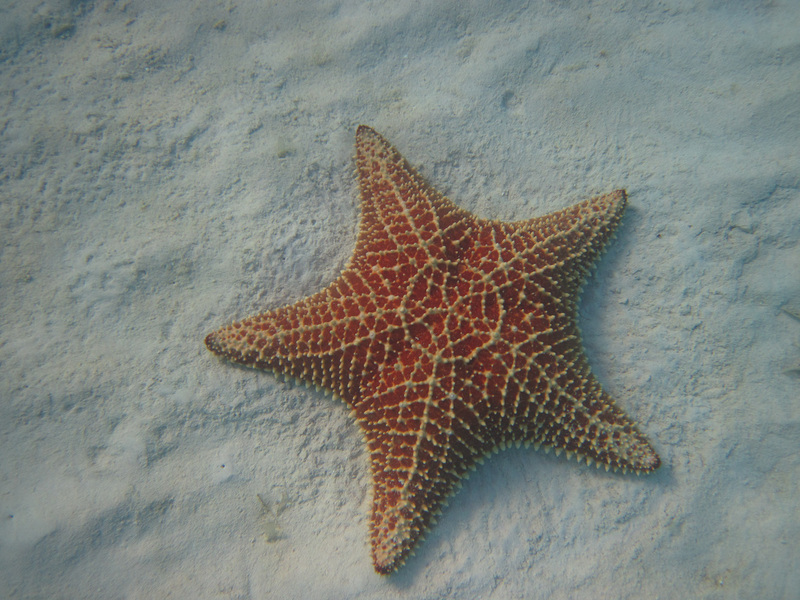 Star Fish - Turks and Caicos - Canon Powershot D10 - The star fish was lying on the sand, at a depth of 2m. (6 ft) approximately. It was well lit and static, and the camera had no difficulty capturing its image. The excellent Photo.net published an interesting Underwater Photography Primer more than 10 years ago. At that time film photography still reigned supreme, but most of the principles exposed in the article still hold true. 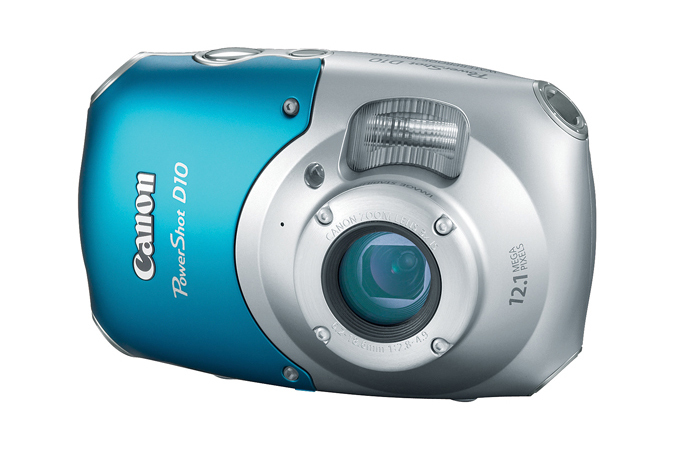 The characteristics of the Canon Powershot D10 are on Canon’s official site.